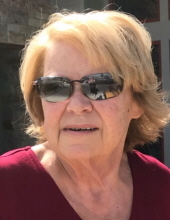 MADISON-Vicky L. Conkey, age 67, of Madison, passed away from dementia on Tuesday, April 9, 2019, at Kindred Hearts surrounded by her family. She was born on Sept. 28, 1951, in Madison, the daughter of Verne and Helen (McFadden) Harrison. Vicky graduated from East High School in 1969. She married Tim Conkey on Sept. 5, 1970, at St. Dennis Catholic Church. Tim provided loving care to Vicky for many years. Vicky worked for the State of Wisconsin for 30 years and was a member of the Four Lakes Yacht Club. She was a talented quilter and loved to make blankets and afghans for her family. Vicky enjoyed many vacations and cruises with her husband of 48 years. She loved to go boating and was an avid reader. Vicky is survived by her husband, Tim Conkey; siblings, Terri (Gary) Schmelzer, Virginia O'Connell, and Bob Harrison; niece, Jill (Joe) Simler; and great-nieces and great-nephews, Lexie and Kaven Schmelzer, and Austin, Collin, and Brianna Simler. She was preceded in death by her parents; sister, Barbara Lane; and nephew, Jeremy Schmelzer. Private family services will be held at a later date. Memorials may be gifted in Vicky's name to Agrace HospiceCare. The family would like to thank Stoughton Hospital, Kindred Hearts, and Agrace HospiceCare for all the loving care they provided to Vicky. Online condolences may be made at www.gundersonfh.com. "Email Address" would like to share the life celebration of Vicky L. Conkey. Click on the "link" to go to share a favorite memory or leave a condolence message for the family.